Ciudad Acuna, Mexico is seperated from Del Rio by the Rio Grande River. 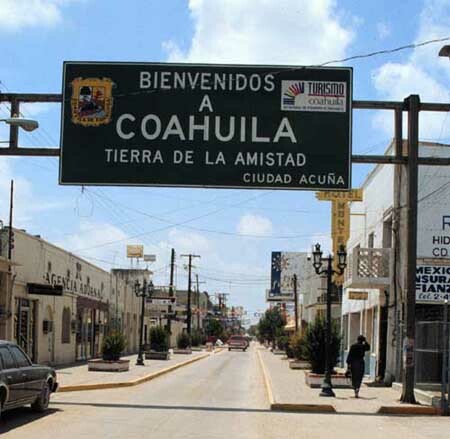 It is difficult to guess at the population of Acuna, but I would put it at 60,000 - 70,000. Acuna is a favorite daytime visit for most of the herpers who go to Del Rio. Most of the "touristy" shops are directly in front of you as you cross the bridge and enter Mexico. For many years, the only way to get to Acuna was through Del Rio - there were no road connecting to the interior of Mexico. As a result, their pricing policies seem to be more U.S. than Mexican, at least for the tourist items. Liquor is definitely cheaper than in the states; The allotment is one bottle for each adult for residents of Texas, two bottles for out-of-staters. If you come accross the bridge, there is a Texas tax collector to collect tax on the booze. There is no U.S. duty if you stay within the limit.The prices for medicines are set by the government and are non-negotiable. This is the source for Flagyl. However, some stores interperet the exchange rate more loosely than others. Pesos are accepted, but dollars are preferred. There are a few passable restaurants. The presently preferred ones among the herping community are Crosby's and La Macarena. The food is safe, but I question the water. The margaritas vary from place to place. Try the jumbos at Crosby's - they can be lethal. The toilets in some places can be an interesting education. Shop around. The prices for the same item vary from store to store. Don't be afraid to bargain on the tourist items. If you want items such as Canel's gum (excellent chiclets), they are cheaper off the main street. I currently pay 90 cents for a box of 60 packs of four. I have never had any trouble driving around Acuna. If you do not want to drive across, there are places to park near the bridge and taxis are available. If you like to suffer, you can walk across, but it is a long walk, particularly if the temperatures are at or above 100 degrees. There is a good chance that you will be inspected as you re-enter the U.S. Do not take firearms or animals across. Tell them what you have. I have never had any trouble bringing back Flagyl. This is the view of Acuna as you enter Mexico. This is the best repaired and neatest street in the town. Other streets are not so fortunate.